During the late 18th century in Denmark, a German physician, Johann Friedrich Struensee, came to King Christian VII’s court as his personal physician. The mentally unstable king struck up a close friendship with his doctor, while Struensee began an affair with the queen, Caroline Mathilda. During this period, Struensee had a strong influence over the king and used it to become the de facto ruler of Denmark. Struensee was a follower of the Enlightenment and as Denmark’s “dictator”, he passed more than 2200 laws (Struensee’s “Reformstorm”) from 1769 to 1772, which limited the powers of the nobility, changed labor laws, and instituted freedom of the press, among other things. In 1772, the king’s mother with the help of the disenfranchised aristocracy had Struensee arrested, tried for treason, and executed. Much of the existing scholarship on Struensee is not modern, but has been published at the turn of the twentieth century. Furthermore, many have discussed Struensee’s reforms in terms of the freedom of the press. I have organized this guide by the type of sources, the primary sources ordered chronologically, and the secondary sources divided into subcategories based on subject matter and language. There is a lot of digitized primary sources that cover the span of Struensee’s involvement with the Danish government, as well as digitized copies of contemporary historians’ works on Struensee, and historians’ from the 19th century. For an overview of Struensee’s rise, reign, and fall the following sources are most useful. They are relatively short, but they supply the most basic information on the topic. Barton, H. Arnold. Scandinavia in the Revolutionary Era, 1760-1815. Minneapolis, MN, USA: University of Minnesota Press, 1986. Arnold’s book on the politics of Scandinavia covers a broad range of dates, and the third chapter “The First Assault on Privilege 1770-1772” gives a detailed description on Struensee’s government. It provides important information on the people involved with Struensee, his allies Brandt and Rantzau, and his enemies, especially Bernstorff. It highlights the salient points of Struensee’s reign, the abolition of press censorship and the dismissal of the State Council, and shows how he became unpopular and ultimately executed. The rest of the book also provides good context for Struensee’s rise in Denmark and the political climate after he was removed from power in the previous and subsequent chapters. Toyne, S.M. “Dr. Struensee: Dictator of Denmark.” History Today 1, no. 1 (January 1951). In Toyne’s brief article, he summarizes all the necessary basic information about Struensee. He includes a brief historical context regarding the politics and power of Europe, then plunges into the story of how Struensee came to court. Toyne does sensationalize the story a bit, especially in regards to Caroline Mathilda, referring to her being popularly called “The Queen of Tears” (only the title of one book about her) and “The Prisoner of Celle” (who was actually an entirely different princess). Nevertheless, Toyne provides a sufficient overview and poses some thought provoking questions at the end of his article. Amdisen, Asser. Til nytte og fornøjelse: Johann Friedrich Struensee. København: Akademisk, 2002. Amdisen’s book on Struensee is indispensible as a comprehensive biography. He shows Struensees relationship with the Queen and the King, and not just in terms of their sad ending. In addition, he brings a new view to Struensee as a whole, arguing that he was not a tragic hero, as some historians have viewed him, but that his reforms were well thought out and made sense in the context of Europe at the time. Some of the best primary sources come from the Danish State Archives. 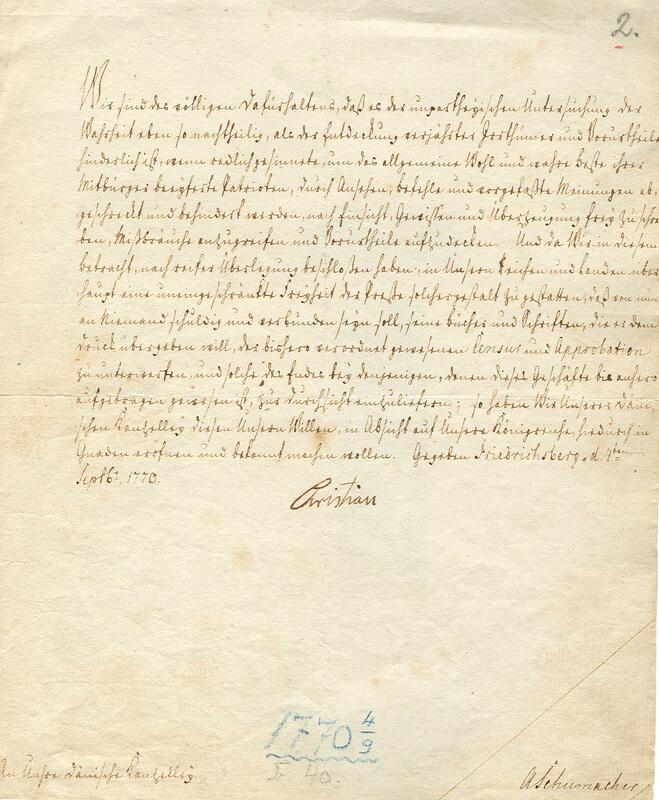 After a recent exhibit on Struensee, they have digitized and made public a collection of documents, titled “Christian VII, Struensee, and Caroline Mathilde” . Among them are copies of eleven of Struensee’s decrees, including the one giving freedom to the press, signed by Christian VII in 1770, pictured below. In addition, there are personal drawings Christian VII did of Struensee and Caroline Mathilda, the documents making Struensee a count, and records of Struensee’s medical treatments for the king. Above is a link to the full collection and below I have linked and cited the most pertinent items. Rigsarkivet – Danish National Archives. Trykkefrihed.4. Oktober 1770. Photo, March 29, 2012. Pictured right, the cabinet order granting freedom of the press. This was one of Struensee’s first major actions, and has been the most widely discussed. Norway, and Denmark. Kongelige Rescripter, Resolutioner Og Collegialbreve for Danmark Og Norge. Kongelige Reskripter Og Resolutioner, Reglementer, Instruxer Og Fundatser Samt Kollegialbreve, Med Flere Danmarks Lovgivning Vedkommende Offentlige Aktstykker … København: Gyldendal., 1766-1776. These documents contain Struensee’s rescripts, or responses to the clergy, universities, and other institutions of authority in Denmark regarding his policies. For example, this includes his reasoning for allowing free press. Voltaire. “Voltaires Brev Til Kongen.” The Royal Library. 1771. 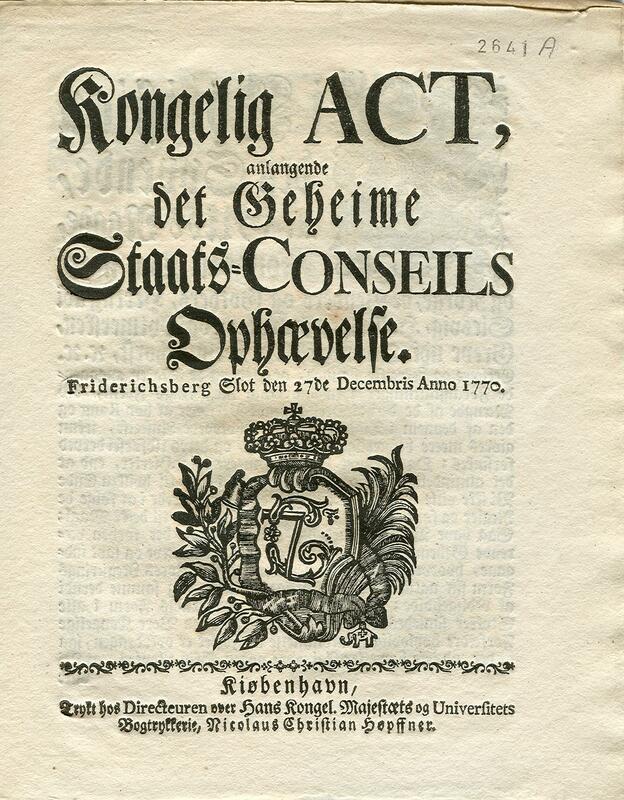 In 1770, Struensee allowed freedom of the press, signed by Christian VII, which attracted a lot of attention from the Enlightenment community, including Voltaire. 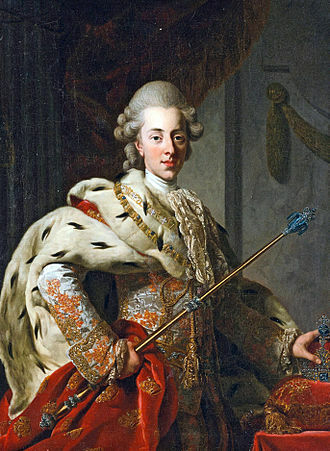 In 1771, the famous thinker sent King Christian VII a letter congratulating him on the change of policy in Denmark and expressing his admiration for the King. Rigsarkivet – Danish National Archives.Ophævelse Af Statsconseil 26. Oktober 1770.Photo, March 29, 2012. Pictured left, cabinet order dissolving the State Council. This marked an important turning point in Struensee’s rise to power, as this was when he officially became de facto ruler of Denmark. Rigsarkivet – Danish National Archives. Afskaffelse Af Helligdage, 26. Oktober 1770. Photo, March 29, 2012. The State Council was very conservative and religiously oriented. Struensee, in an effort to make Denmark more secular, issued a cabinet order to cut down on the number of religious holidays practiced. Rigsarkivet – Danish National Archives. Caroline Mathildes Underskriver Sin Tilståelse, 1772. Photo, March 21, 2012. Caroline Mathilde’s confession that she had an affair with Struensee. Signed by her, this document also divorced her from Christian VII and exiled her. The Trial of Count Struensee, Late Prime Minister to the King of Denmark, before the Royal Commission of Inquisition, at Copenhagen. London, 1775. A transcript of the trial of Struensee, including the accusation, defense (written by Struensee himself), judgement and sentence. Reverdil, Elie Salomon Françios.Struensee og det danske hof, 1760-1772. Kjøbenhavn : A. F. Høst, 1917. Reverdil was a teacher of Christian VII’s and wrote a few memoirs about his time with the king. This book, published after his death, details what he heard and saw during Struensee’s time in Christian VII’s court. An archive of Reverdil’s other works can be found here. Much of the scholarship on the subject of Struensee is in Danish (or German) and are contemporary or 19th to early 20th sources, with the exception of Bech, being one of the few pieces of extensive modern scholarship. All describe Struensee’s rise, reign, and fall in detail and are the leading sources, having been cited by other articles and books on Struensee. These sources are known to be the most crucial for studying Struensee. Bech, Svend Cedergreen. Struensee og hans tid. 2nd ed. Viborg. Forlaget Cicero, 1989. Holm, Edvard. Danmark-Norges Historic fra den Store nordiske Krigs Slutning til Rigernes Adskillelse 1720-1814.1 vols. Copenhagen 1891-1912. Høst, Jens Kragh. Der dänische Geheimekabinetsminister Graf Johann Friedrich Struensee und sein Ministerium. J.H. Schubothe, 1826. Wittich, Karl. Struensee. Leipzig, 1879. Commager, Henry. “Freedom of the Press in Denmark.” Scandinavian Studies and Notes 9, no. 8 (November 1, 1927): 258–66. Commager puts the freedom of the press under Struensee into a larger context of Enlighenment thought and the political climate in Denmark at the time. He compares the situation in Denmark with other European countries, and argues that Danes had some freedoms when it came to publications and that Struensee’s abolition of censorship was not entirely ground breaking. Commager also described the aftermath of the decree, and how Danes reacted to it. Laursen, John Christian. “David Hume and the Danish Debate about Freedom of the Press in the 1770s.” Journal of the History of Ideas 59, no. 1 (January 1, 1998): 167–72. Laursen goes into detail about Struensee’s abolition of press censorship. The main topic of the article is a Danish political analyst of the time, David Hume, but the article supplies good information on the effects of Struensee’s decree in Denmark and more details about Voltaire’s letter to Christian VII. Laursen, John Christian. “Spinoza in Denmark and the Fall of Struensee, 1770-1772.” Journal of the History of Ideas 61, no. 2 (April 1, 2000): 189–202. In this article, Laursen describes Struensee’s fall by describing his opposition, and around what issues they formed. He argues that much of the anti-Struensee sentiment was related to anti-Spinoza sentiment, a Dutch philosopher from the previous century who laid the foundation for Enlightenment thinkers and was considered a heretic. Winkle, Stefan: Johann Friedrich Struensee. Arzt – Aufklärer – Staatsmann, Stuttgart: Fischer 1989 (2nd ed.). Winkle’s book holds a lot of useful biographical information on Struensee. He also includes extensive medical history of the time and how Struensee and his views fit into it. Integral to the story of Struensee, are Christian VII and Caroline Mathilde. The following are sources are biographies on both of them. They detail their relationship with one another, as well as their relationship with Struensee, and his government. Reddaway, W. F. “King Christian VII.” The English Historical Review31, no. 121 (January 1, 1916): 59–84. Reddaway is oft cited in works regarding Struensee and Christian VII. This article is a biography of Christian VII, focusing on his personal relationships with those around him. Much of his sources come from English diplomats in Denmark, who were very familiar with Christian. Reddaway also pays special attention to Christian’s mental health and his narrative during Struensee’s reign. Chapman, Hester W. Caroline Matilda, Queen of Denmark, 1751-75. London: Cape, 1971. Jørgensen, Harald. The Unfortunate Queen Caroline Mathilda’s Last Years, 1772-75. Copenhagen: C.A. Reitzels Forlag A/S, 1989.